We’ve been delighted to see some fantastic words of praise rolling in across our social media and review sites these past months – it really brings a little warmth to our hearts, as the weather turns cooler, to see how much the Cocoa Tree Café and Pittenweem Chocolate Company are loved by locals and visitors alike. Don’t forget you can leave your review for the Cocoa Tree Café on Trip Advisor, Yelp or Facebook. You can also tell us what you think through our Twitter feed. 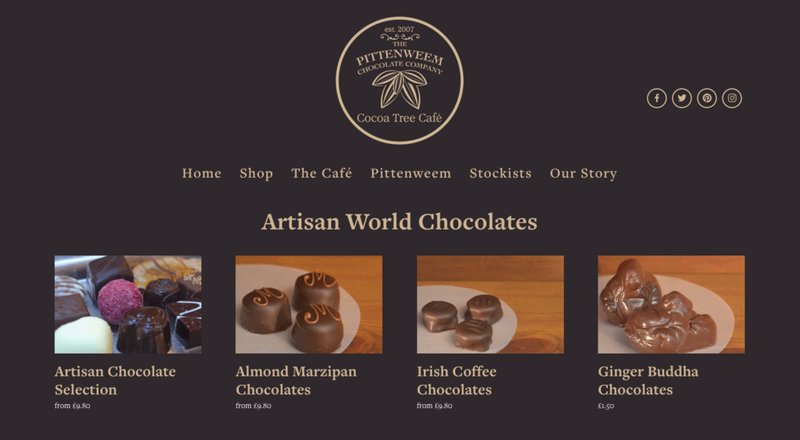 Here at the Cocoa Tree and Pittenweem Chocolate Company we are thrilled to have our new website up and running. As you may have seen in last week’s post (here), the old features have had a revamp and there are some great new ones to enjoy too. For us, one of the best bits is our new online shop – we can’t stop looking at it! A vast selection of our ‘handmade in Pittenweem’ chocolates are now available to buy online. Including our relatively new invention, the Irish Coffee chocolates. Using a coffee and whisky blend, these are boozy little treats that will get your taste buds thumping.